Industrial gas has become a slow growth or no growth industry, depending on location and business mix and the consequence is increased (attempted) M&A to drive synergies, spur growth and attempt to defend high valuation multiples. Growth based on industrial development exists in emerging economies but these bring political and currency risk as well as new local competition. Innovation to drive increased gas use has dried up with novel gasification processes either failing to generate acceptable returns or failing completely. While everyone now wants to “stick to their knitting”, there is not enough “knitting” to go around – i.e. absorb available free cash, resulting in slower growth and risking multiples. M&A focused on cost reduction opportunities seems to be the preferred path but opportunities are very limited. The size of the PX/Linde opportunity looks significant, but it is sufficiently shrouded in uncertainties that investors are not yet willing to pay for the possibilities. There appears to be plenty of cost/synergy opportunity even allowing for some of the structural differences between the two companies. We believe that the deal could very conservatively add $500m of EBITDA to current PX ($1.20 per share) – Exhibit 1. But uncertainty around whether the deal is even possible, added to timing, divestments, and then how long it would take to get the benefits is why the stocks are standing still. We are generally cautious on the sub-sector, preferring Air Liquide on valuation and US growth plans. PX and Linde have upside if the companies can execute the merger and then surprise on the upside on synergies – dollar amount and timing. We need more clarity and a higher degree of details before we would get more excited. 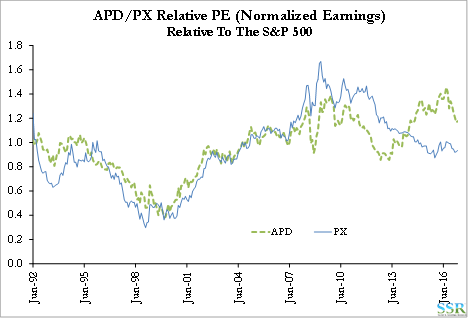 But we see two relative trades – APD is close to an all-time peak relative multiple versus PX. APD had the earnings story but now it looks like PX does – that gap should close. 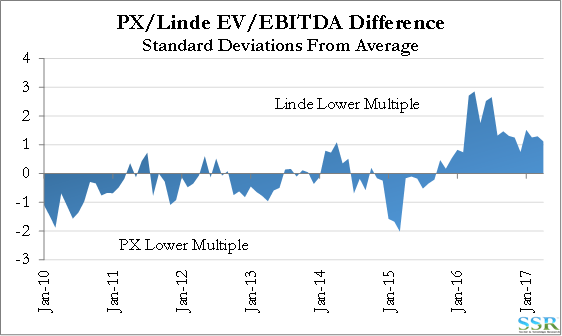 Ignoring currency risk, LIN has upside vs. PX because of relative EV/EBITDA arbitrage. So – Short APD/Long LIN. The traditional industrial gas business is showing no sign of improving demand growth anywhere and the only growth markets today are in the developing world where companies face currency risk and political uncertainty. Novel markets and/or peripheral businesses have proven very unsuccessful for the industry in recent years, unlike in the early part of the last decade, resulting in sub industry average margins and/or complete failure. While most of the majors have significant leverage in underutilized air separation capacity – all of which carries significant incremental margin (and promise) – without the growth the surplus capacity has no value. One rather obvious small scale strategic move that makes sense to us in the US as a consequence is that both PX and APD should consider selling air separation facilities to Airgas (Air Liquide) where it looks likely that Airgas will build to support its packaged gas business. There should be deals to be done that are better than the alternative for both parties in a handful of locations. Strong earnings growth in the sector drove improving returns and high valuation multiples for the US companies – Exhibit 2. It is interesting to see the relative tracks in both charts, with APD benefitting dramatically versus PX from its change in management and strategy in 2013. While returns appear to have converged, market sentiment has not, with APD still receiving a significant “benefit of the doubt” premium to PX. What is particularly interesting is that the market gave APD the valuation boost on the announcement of new leadership and a new strategy – PX has clearly suggested a bold strategic move with Linde – one which could generate significant shareholder value over time, yet investors remain skeptical – this for the company that held the position of “industry darling” for almost 10 years. 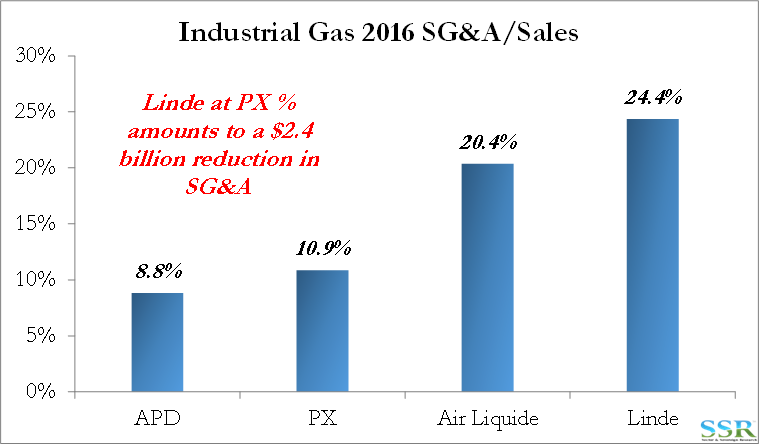 Some of the return on capital difference is a function of business mix – Exhibit 3 – and APD should have seen an improving return on capital relative to PX as it divested its US packaged gas businesses over time. Packaged gas generally has a lower return on capital than on-site or large pipeline/merchant, unless you can turn the packaged gas cylinders quickly, which is generally not the case, or unless the on-site/merchant business operates at reduced rates. Reducing a merchant plant operating rate from 90% to 80% can reduce return on capital by as much as 500 basis points. 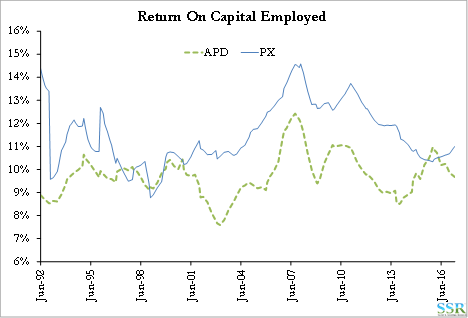 APD should have had a higher or at least comparable return on capital vs PX, before the change in management and the opportunity to close this gap would have been one of the most compelling opportunities seen by Pershing Square. The recent drop at APD is because of the chemicals sale and the Versum spin as both businesses had higher returns on capital than the company average. Today, APD is the company that again looks like it might be on the back foot; Air Liquide has opportunities for growth in the US with Airgas, and PX and Linde could have a very interesting story if they can pull off the merger. APD needs a new story – spending billions behind large Chinese coal gasification projects was one of the moves that got the company in trouble in the early part of this decade – setting up the activism and management change. We are unconvinced that that path today is any less lined with potential potholes than it was 8-10 years ago. Exhibit 4 frames some of the opportunity. There are a number of reasons why the combined entity will not get to PX’s levels of cost, which include the structure of Lincare and Linde Engineering, but even if $1.5bn was available over a 3 year period, this would be a 20% increase in combined EBITDA – something neither company, nor their competitors, have a chance of achieving on their own. This should allow the combined company to deliver low double digit total shareholder returns for the next several years – supporting and possibly lifting current multiples. While we are concerned about how much combined capacity may need to be divested and are assuming as much as $3bn of revenues, these assets will sell for a multiple of sales, given their “fixed income like” returns, and should be accretive to overall earnings. 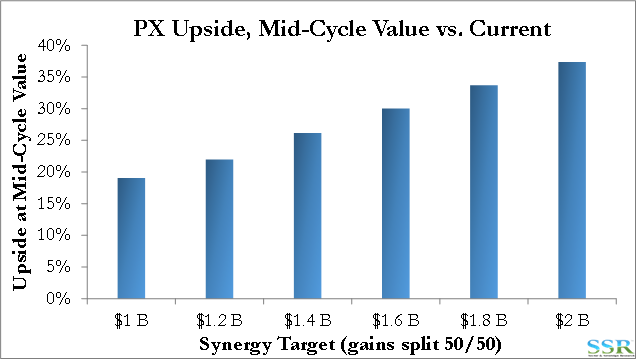 Conservatively, if we add $500 million of synergy driven EBITDA to PX, and over time we expect the number to be higher, we add around $1.20 to normal earnings and generate a mid-cycle price for PX of approximately $145 per share – 22% upside. Given all the uncertainty in the deal (the “ifs” listed above) it is probably not surprising that the stock is trading at such a discount to the potential – investors will likely need more certainty and more detail before they begin to give PX (and Linde) the benefit of the doubt. The underlying growth of the industrial gas business is slow – it is a GDP minus rate at best and an Industrial Production minus rate at worst. Recently in the developed world it has been IP–. What the industry and, in our view, investors, are struggling with today is that the current underlying growth rate is likely at best the norm, given the trend in Exhibit 5. The period that most remember from the late 1990s to the late 2000s was the exception! We show revenue and volume for PX in Exhibit 5 to show that it is not just a currency problem. Remember that Union Carbide spun out Praxair because it thought the company was (combined with CBI) an underperforming business, dragging down the whole. The “golden age” of industrial gases, which caused the relative multiples to expand in the first half of the 2000s, had a lot to do with costs, but it also had some one-time growth drivers – pushed by innovation on the part of the gas companies and their customers. Co-Jet was a PX technology that increased efficiency in steel production by increasing oxygen consumption. Food quality and shelf longevity benefited from step changes in the use of nitrogen for freezing and to prevent oxidizing. Portability advances made significant changes in healthcare and increased demand at the same time. The move to more heavy crude as a feed for refineries at a time when ethylene production (and co-product hydrogen) was not growing created a wide window for the construction of hydrogen plants in the US. Some of these were one time step changes, some have been substituted already and in the case of hydrogen in the US, as we dramatically increase ethylene production and reduce the amount of heavy crude used, in favor of light, low sulfur, shale crude, it is possible that on-purpose hydrogen demand could peak and start to decline. Meanwhile, new applications/ventures have failed, either to generate acceptable returns or in some cases work at all. 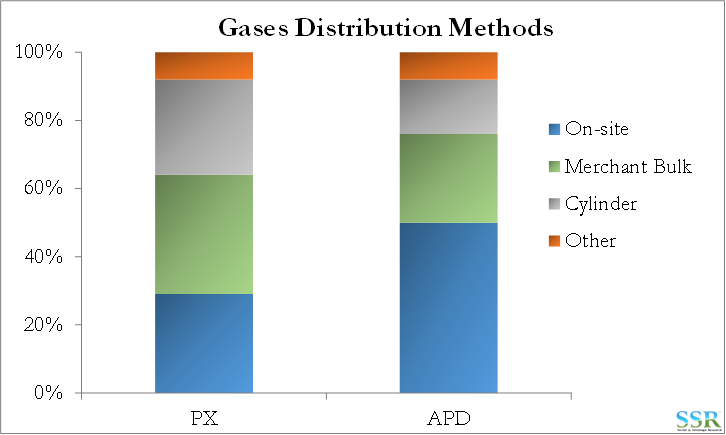 Gasification ventures have been generally unsuccessful, whether biomass or MSW driven, mostly because of issues with scalability, with APD the least fortunate but not alone in failed initiatives. Our view is that the risk appetite – the willingness to go off-piste in search of new sources of demand for industrial gas, or in search of new peripheral businesses – is well below what it was 10 years ago. Our concern is that outside the developing markets, underlying growth is slowing for any given level of GDP growth as consumer spending becomes a larger component of GDP. IP is becoming less reliable as an indicator of growth in the developing world as consumers of industrial gas seek efficiencies themselves (in a slow growth world) and learn to work with less, or at least no more. At the same time we are seeing new local competition, such as Yingde in China, and while they might not be able to compete in the mega gasification projects (yet) they are effective builders of simple air separation units – and low cost. PX is chasing Linde because it could be good; but is almost definitely better than the alternative. Chasing growth that does not exist is a losing strategy as even with only 4 or 5 players in a market the bidding process will drive margins lower. Choosing to limit investment rather than chase it, and instead pursue a consistent significant buyback program is a credible alternate strategy, but it takes away the growth and the leverage that have historically driven high multiples for the sector. The real risk that the industry is trying to avoid is multiple contraction. 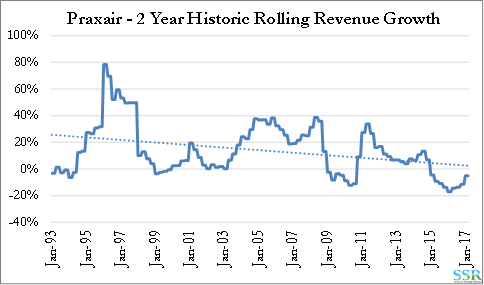 PX has experienced a steady decline in its relative multiple since peaking in 2008 and in our view the “new story” at APD has played out – the company has limited options and the multiple slide is about to begin again. Stock multiples – whether of earnings or EBITDA and whether absolute or relative – are a function of three things: expected earnings growth, expected earnings predictability, and confidence in management (to do the right thing with cash and to keep the growth rolling). By combining, Linde and Praxair may have to divest several billion dollars’ worth of assets, but their ability to run what they keep with one rather than two global organizations presents plenty of opportunities for cost reduction. 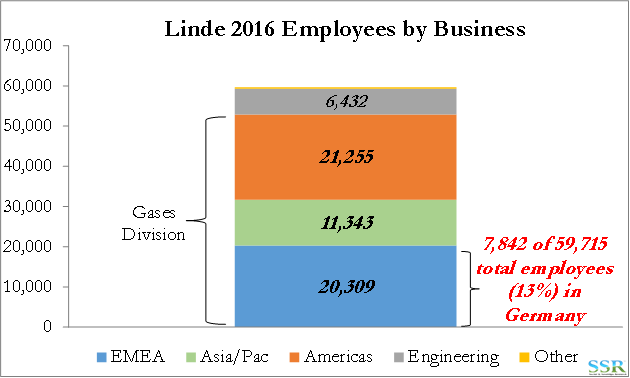 Linde has many more employees than Praxair spread all over the world – Exhibit 6. There are dozens of locations where each company has a country or regional office. 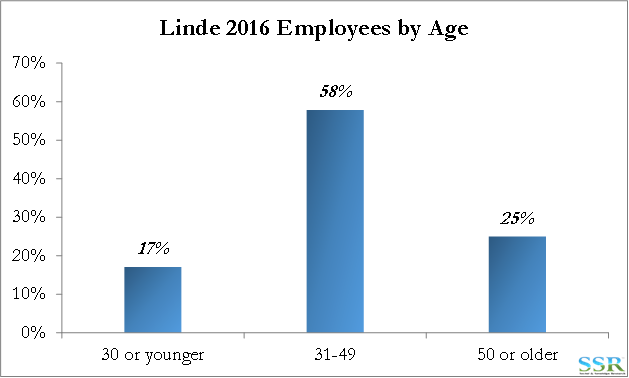 Some of the cuts at Linde may be achievable through early retirement programs – Exhibit 7. Is There a Relative Trade? The relative multiple gap that has opened between APD and PX in Exhibit 2 shows the relative stories of the two companies over the last three years. APD has had a good story – new focus – cost cutting – portfolio realignment etc. The company has been rewarded with better earnings and more investor confidence – driving the higher multiple. PX has been the victim of its already very low cost base and has no levers to pull, has been forced to watch the lackluster economy – earnings have disappointed, confidence has dissipated and the multiple has gone with it. In Exhibit 8 we compare the relative multiples of the two companies over time and generate a standard deviation to show statistical significance. Had we been in possession of this chart in 2012 we might have been more aggressive advocates for change at APD! 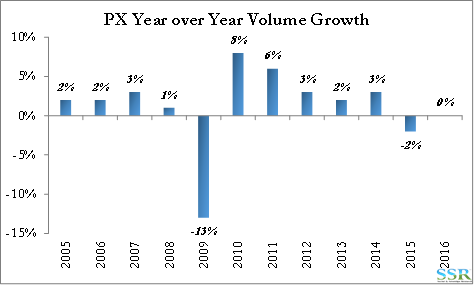 However, today PX has the story – and APD’s growth levers are mostly behind the company. Already the peak in valuation difference is gone. If we assume that PX has an interesting opportunity with Linde and APD has nothing to add to its current plans then we should assume at least a normalization of valuations, or perhaps PX getting the upper hand again. 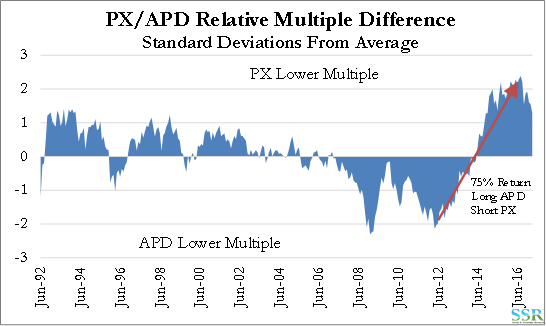 To get back to the average, PX would need to see its multiple relative to APD’s move positively by 24%, suggesting a 24% relative opportunity. While the APD/PX trade looks interesting it is important to note that Linde trades at a significant discount to PX on an EV/EBITDA basis and that there would be some aggregation as a deal takes shape. This either presents downside risk for PX’s multiple or upside risk for LIN – with a quantum of around 50% – i.e. the level of discount in Linde’s equity resulting from its multiple relative to PX. Consequently, the safer trade is probably short APD, long LIN. If PX and LIN were to move to the mid-point of the PX/LIN range and the APD/PX spread were to collapse, the upside from shorting APD could be as low as zero when paired with PX but as high as 49% owning LIN.